India Parcel Post has a service that is both practically and aethestically unequalled in any country I've visited. If your goods don't fit into an envelope, you find the person who is usually right outside, selling envelopes, staplers, glue sticks, cellotape and pens or sometimes sits on the footpath with a bundle of white material. 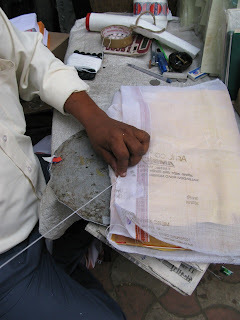 They will then proceed to stitch your parcel into a perfect sleeve of white calico or cotton with white string. The seam is finished with a red or brown wax and each spot of wax is pressed with a seal. The completed item is beautiful. I marvel at the contents being reduced to a form of clean white simplicity. I admire the touch of the hand in the sewing and sealing. And while I am slightly reluctant to let it go, it gives me a lot of pleasure to think about the receiver at the other end. It's my friend Fenn Idle's birthday today. He is fifteen. I sent a present to him last week from Rashbehari Post Office. He lives in Darlinghurst, Sydney.